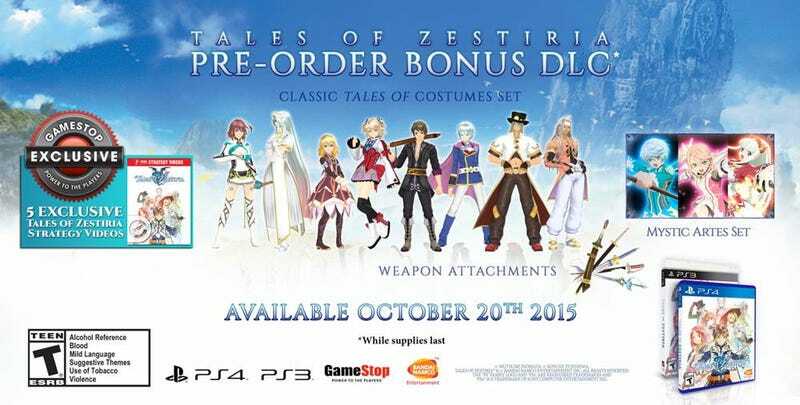 The lucky Canadians and Americans who pre-order Tales of Zestiria for PS3/PS4 from Gamestop and EB Games will get access to classic Tales of costumes. This is a standard bonus that used to come with the games prior to Vesperia however is now relegated to “exclusive” DLC. I say “exclusive” as the odds of this staying exclusive are quite low this is Namco after all. However the costumes that totally should be free are not actually the worst part of this. Pre-ordering the game will also give you access to “Strategy Videos” from Prima Strategy Guides. Yes the people who make guides for a game almost as expensive as the game itself are generous enough that if you pre-order they grant you access to videos that almost certainly would totally have been free otherwise. No word yet on how the videos will be distributed but I’d be surprised if they’re on disk. However considering one of these “Strategy Videos” is currently up on Youtube as a free teaser we may have our answer.